Tobit Fortran wants to be the first person to die live on the Internet. He’s marketed his story, got sponsors, arranged for his body parts to be sold upon his death. It’s all set and it should be easy for Tobit. All he has to do is die. But, Tobit learns, things don’t always go as they’re planned. With less than two weeks before his scheduled Internet death, Tobit still has not found a new husband for his wife, several sponsors have backed out of their contracts (including a beer company, who feels Tobit’s death will associate their beer with death), and he’s come to the realization that death is final. And this is just for starters! Soon Tobit is visited by his fairy muse, who tells Tobit that he is a god. With only days until his death, Tobit begins an epic journey to discover why his death is so important. Along his journey of discovery, Tobit travels through hell and finds the wonderful afterlife that awaits him. 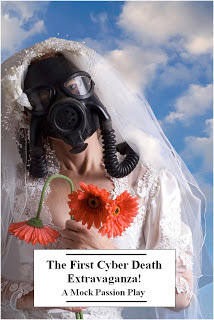 The First Cyber Death Extravaganza! is an Internet mythology that is filled with a rush of pop culture illusions, and ultimately the kind of social satire that’s howl of rage effectively moralizes in its ironic tone what the world is becoming. The book was finished ten years ago by Scott Douglas (McSweeney's Internet Tendencies contributor, and the author of "Quiet, Please: Dispatches from a Public Librarian"); though the characters are sometimes dated, the idea is as relevant today as it ever was. It's guaranteed to be one of the weirdest things you ever read!